My wife and I are expecting our second child near the middle of 2012. Of course with the excitement also come the concerns. By the time he/she will have been born, our first child will already be 5 years old. Like many, many parents, we hope that we remember what to do and what not to do. On top of making sure this new life is getting everything it needs to develop, but also making sure we go through our storage to check the condition of old toy, cribs and so on. If I remember correctly, my wife didn’t have a BlackBerry smartphone when she was pregnant with our first, so our communication/reminders consisted of phone calls and SMS. This time around, BlackBerry is all over it; BBM, Browser, Tasks, Calendar, you name it it’s being used. Now for you, that may not be enough. There are many applications out there that can be used during your pregnancy. There are also app that are specifically designed for those who are preggo and proud. Let’s take a look 5 must-have BlackBerry smartphone pregnancy applications. Please remember that, although the applications are extremely useful, they by no means are meant to replace the advice of you’re family Doctor or OB/GYN. We also do not take any responsibility if you end up giving birth to a mutant with extraordinary powers. Our own Kerri sent me an email about this application, which reminded me that we have looked at this before. TickerBaby is an extremely simple app, so much so that it should be dubbed a father-friendly app. My wife would ask me how far along she is, and I would give her a rough estimate (within a ½ week). With TickerBaby, you have a clear cut view of when your baby is due (uses days and weeks) as well as which trimester you’re currently in. To help plan for the upcoming bundle of joy, TickerBaby has a list of tasks to look though. They include things as simple as installing a car seat o more important tasks like looking at life insurance. The application integrates nicely with your task, enabling you to create reminder of important appointments or visits. TickerBaby is part of a suite of apps made available from BabyBerryApps. 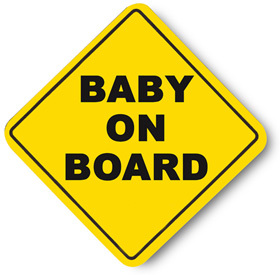 With the excitement of the upcoming baby your brain may turn to mush. My wife tells me it’s a well known fact, so I guess it must be true. In that case, it’s a good idea to record important information in a safe place. Luckily, your BlackBerry is just such a place. 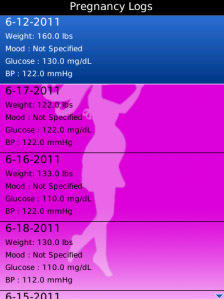 Pregnancy Log wants to be the safe house for your details like moods, weight, glucose levels and so on. The logs are listed by date, so you can easily see your how your details are changing over time. The details are then made available as individual reports which are nicely laid out in a graph. Other information, such as your events in a day, are also able to be recorded. If I ever able were to get pregnant, I would probably be the laziest thing on the face of the planet. I know I shouldn’t be; exercise especially I s important during pregnancy. My wife‘s doctor told her that it’s possible (and healthy) to lose or maintain weight while pregnant. Now I don’t want to see anyone bench pressing 200 lbs when they’re 8 months pregnant. I came across Pregnancy Yoga and thought it to be the perfect solution. The application gives you some great examples of yoga exercises for each trimester and even some exercises to try out postpartum. Pregnancy Care’s menu gives details about sun salutation, general remedies, posture and which activities that should be avoided. During your pregnancy, there will be many important dates; the first time you felt movement, the first time you get a craving and maybe even the first time you can blame the baby for your bad gas. Pregnancy Calculator, from the same developer that created Pregnancy Log, is designed to inform you of important dates. It can estimate the date of conception, when the heart starts beating, start/end dates of trimesters. If you plug in your last menstrual period, the application will calculate the due date for you. Of course you should always rely on the information of your doctor, but the dates the application provides will add to the excitement. Genoa is well known for their checklist applications that are geared towards specific jobs or occasions. Of course, they created the Pregnancy Checklist application. A checklist is the best way to get the dad-to-be to stay on top of things. 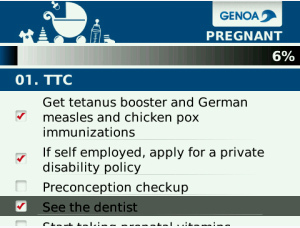 Pregnancy Checklist is loaded with suggested entries to select from, or you can create some of your own. Above your checklist is a progress bar; sometimes, all it takes to see how well you’re tackling a checklist is a progress bar. If you have multiple lists in place, then you can see a progress bar for each of them, so you can see where you need to focus your efforts a little bit more. It’s up to you how you break down your list; some seem to make sure they divide it into weeks or trimesters while others may assign by type. Just make sure everything is ready to go by the time the baby comes.